The most challenging piece of the entire project. First, I tried to think of and sketch a general concept. I knew I wanted to make an intimidating panther but I wanted to make it unique. The key to an illustration like this is to determine the most identifying aspects of the animal. What absolutely has to be there? 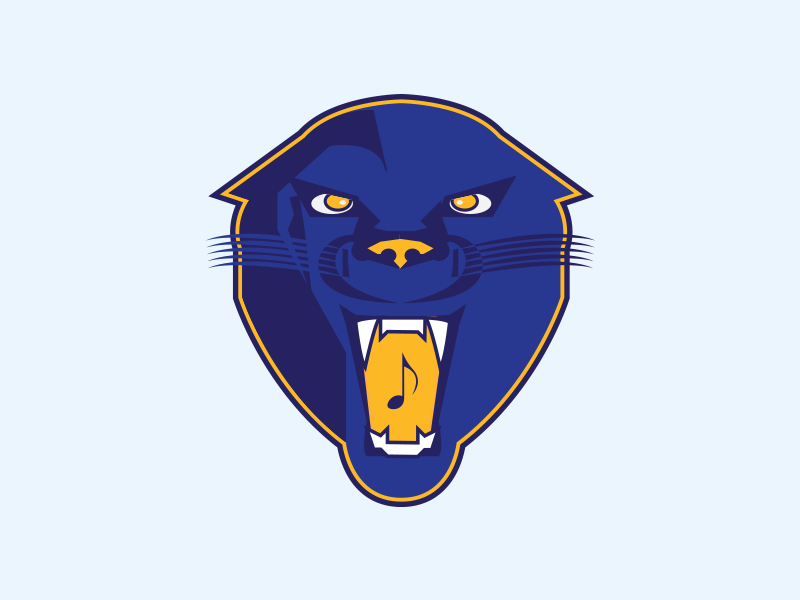 You’re not trying to draw everything single hair on the panther’s head but people need to be able to tell what it is. Structurally, I used the power of symmetry to make half of the face the way I wanted then copy and reflect where I could. With something like this, I needed to get the general shape of the head and essential elements right before adding any shadows. Naming and organizing layers was crucial. There were a lot of parts to this logo that had to be managed. The five whiskers on either side of the nose represent the 5 lines (and 4 spaces) on a musical staff. I also put a musical note on the tongue. Hidden within the nose area are two bass clefs with the lines on each side acting as the beginning of the musical staff. I love logos that have references throughout the design that don’t distract from the overall concept. I’ve made similar references in the past. The letter mark was a much easier task. 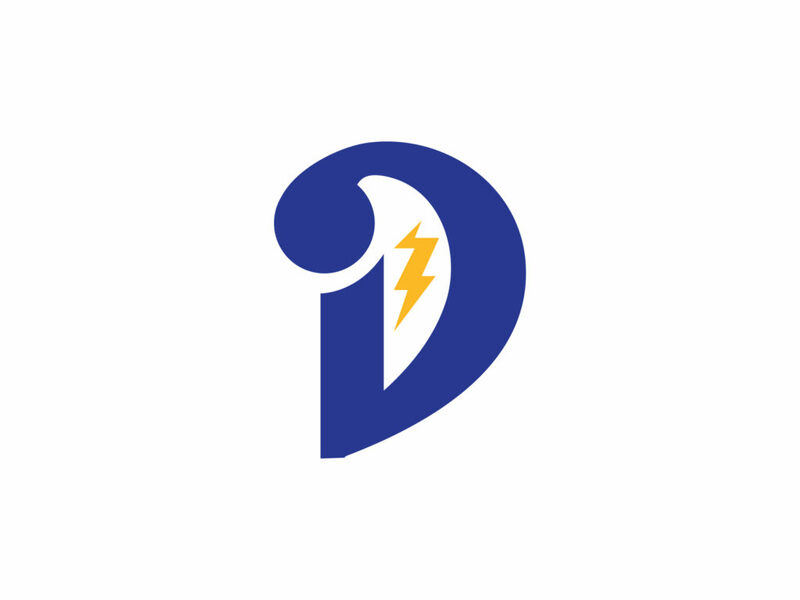 I took a bass clef and extended its shape upward to make the D. The thunder bolt inside references the Dudley High School band nickname, “The Band of Thunder”. While the panther acts as the big, in-your-face logo, the styled letter D can be used on polo shirts, hats, etc. as the formal stamp of the program. Mr. Hayes also asked me to come up with shirt designs that included the logo and the text surrounding it. His concept was something comic book / superhero like. I used Superman comic covers as inspiration. The cloud and extra shapes were used to add to the overall feeling of power, pride, and ferocity. I am very happy with the end result. This project pushed me outside of my comfort zone to make something more intricate and involved. 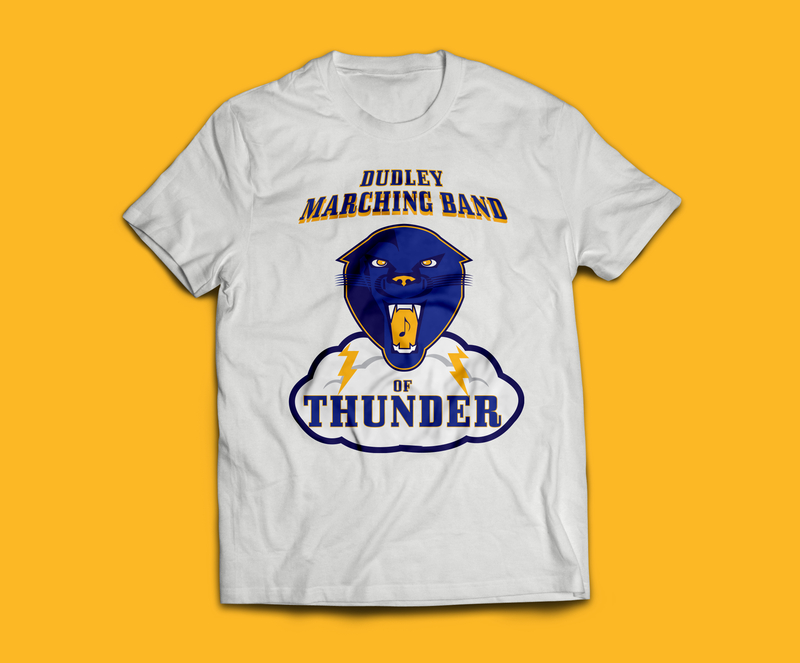 I’m very glad I could help with the branding of one of the premiere high school band programs, which happens to be in my hometown of Greensboro, North Carolina!